For those who suffer from iron deficiency anemia it can be a frustrating condition until it is diagnosed. Left untreated it can effect the function of other organs. Since the causes are not 100% clear, further iron deficiency anemia clinical research is needed. If you or someone you know has been diagnosed with this ailment, you might consider participating in a current iron deficiency anemia clinical trials. There are new trials being conducted all the time and participation is at no cost to you. 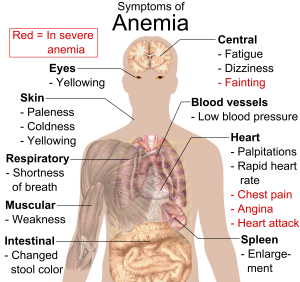 Iron deficiency anemia is a condition that is caused by a loss of iron usually due to intestinal bleeding or menses. The most common cause for intestinal bleeding leading to iron deficiency anemia is the presence of hookworms, whipworms or roundworms. These worms cause about 50% of the iron deficiency anemia cases worldwide, which amounts to more than one billion. Symptoms include appearing pale and feeling tired and weak. It is a condition that comes on slowly and is not always easily detectable. Another major cause of iron deficiency anemia is a lack of absorption of iron. Iron deficiency anemia treatment can be as simple as replacing iron through eating more iron rich foods such as beans and lentils. There are also many iron supplements available. Studies have shown that it is best to avoid taking supplements with beverages such as coffee or milk as these will inhibit absorption. If supplements in the form of pills don’t work iron can be administered using a drip. Levels need to be measured after the drip to ensure they are safe. Iron supplements should always be kept out of reach of children. Obviously if some type of worms are causing the problem the iron deficiency anemia treatment would include taking care of the worms first.